Keller Williams' Amy Jones Real Estate Group partnered with Big Helper Realty Group at Revelation Real Estate to research, create and launch chandlervsgilbert.com. The teams say that presenting information to buyers in this way could change how agents "paint" cities for their clients. That’s the question that agents in the Phoenix area who service Chandler and Gilbert are constantly hearing. So two real estate teams joined forces to answer it with a website: chandlervsgilbert.com. “Once we got together and determined that this was a really relevant concept for consumers — both for those moving within the valley but more significantly for those moving to the valley from other places — then we figured out what data points would be most relevant and talked about how we wanted to present it to the community,” added Mindy Jones Nevarez, Realtor and manager at Keller Williams’ Amy Jones Real Estate Group. Both teams sponsored the project, and the Amy Jones Real Estate Group’s contact information is listed on the “real estate” section of the website. Caroline Porter with Sure Spark Marketing helped the teams put the report together, and she noted that after the teams tapped Mike Orr, they had the credibility they needed to make their “versus” report shine. Orr is a well-known Phoenix-area statistician and former Arizona State University professor who tracks the daily residential real estate market through his Cromford Report. “He helped us find the unique data for the real estate statistics,” Porter said, which includes appreciation data, average home size, the number of new homes built in 2016 and median sales prices. “That was important in terms of a credibility standpoint,” added Merrill Jencks, also with Big Helper Realty Group, noting that real estate agents throughout the valley are familiar with the Cromford Report. 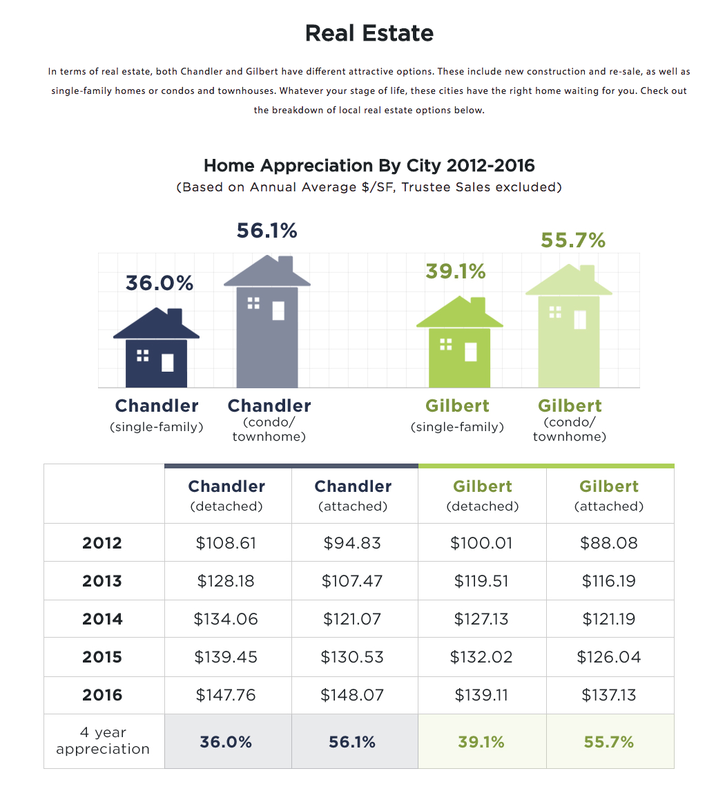 So researchers scoured the Chandler and Gilbert city websites as well as Yelp and local magazine articles, then aggregated what they found. “If you’re a family and you know you need to move in the summer and you’re moving from out of state, you’re not going to have the time to sit down and go, ‘What’s the closest dog park, what are the closest restaurants, what’s this downtown like vs. that downtown.’ So the idea was to take data that’s already out there but isn’t easy to find,” Porter explained. The groups got between 100 and 150 out to the Chandler-Gilbert Community College (yes, that venue was chosen deliberately in part for its name) for the launch of chandlervsgilbert.com — they wanted it to be “something that was borne out of community creativity,” said Jones. To that end, both teams promoted the event on social media and helped provide the booths for the party itself — face painting and balloons for kids, and information from neighborhood partners for adults. “We had food trucks and booths; local dignitaries from both Chandler and Gilbert came — and they had a tug-of-war battle, which was pretty entertaining,” Porter said. 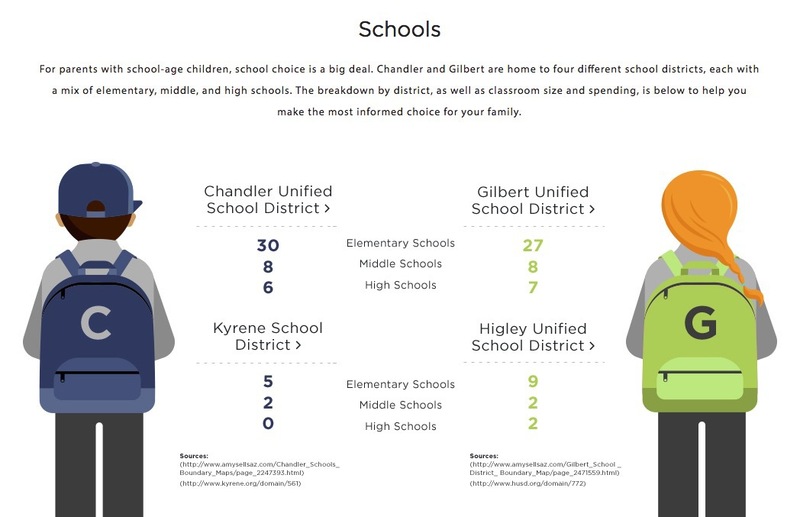 Kristi Jencks says she’s already heard some requests for site updates and new data — including a Chandler vs. Gilbert showdown on who does gluten-free food better or which community has the best day spas. “We had to start with five categories, but we’ll continue to add to it,” she said. “It’s been fun to partner with the local community and do these community spotlights — and those businesses are going to benefit from people moving into the area. “We just want to show that these two real estate companies know the area really well,” she concluded. “We really put the consumer first when we decided to partner together to put this out,” added Jones Nevarez. “There are obvious benefits to a consumer with that type of a model — but there are also benefits for brokers or Realtors; it allows you to gain access to public officials; it allows you to build partnerships with the local business community. “Realtors are the ones often telling buyers and sellers where to go shopping, what’s a good place to visit or eat, where to spend their money — and Realtors could do an even better job partnering and sharing information. The way we paint our cities could look very different,” she argued.